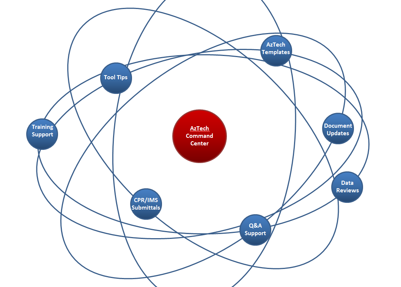 AzTech Command Center (ACC) is a completely new way of providing Program Management support to clients. An alternative to expensive time and materials support, ACC provides flexible, rapid, and targeted support with clear deliverables. These offerings are aimed for precision support during key periods of the program life-cycle. Each of the following support packages includes a clear SOW and targeted deliverables. Build Earned Value Management System: Conduct an EVMS assessment to find gaps in people, processes, and tools required to meet the ANSI-EIA-748 32 Guidelines for EVM Implementation. Alternatively, we can implement an “EV-Lite” solution using a combination of your existing tools plus AzTech tools and processes. Build Control Account Plans (CAPs): Conduct workshops to help your team develop detailed CAPs with integrated work scope, deliverables, period of performance, and schedule logic plus proper earned value methods. Learn EVMS Life-Cycle: Provide dedicated training to project teams focusing on any area of the EVMS life-cycle. We use a combination of workshops, formal training plus mentoring and coaching to help the team develop in-house capabilities. · Remote Training Support: If your team has a particular EVMS or IMP/IMS topic you would like us to cover for your team, AzTech SMEs can schedule one Webinar per month to discuss various EVMS topics of importance. These can include existing training or workshops such as QBD, VAR/EAC, Review Preparations, or ad hoc topics. · Remote CPR and IMP/IMS Submittal Assistance: Contact us for any questions or issues that arise in the monthly reporting cycle, including providing a summary critique of the IPMR Formats and IMP/IMS submittals either before or after submittal. Generate XML and / or PDF files for IPMR/CPR and CFSR submittals. · Program Team Q & A and Technical Support: Telephone, e‑mail, and Webinar answers to questions from the project team. These can include topics like Excel models, formulas, or macros; MS Project templates, tool tips, or tricks; IMP/IMS implementation issues; EVMS implementation issues; or EVMS compliance questions. · Data Review and Comment: Review RFP write-ups, baseline planning documents, or Variance Analysis Reports (VARs). · Documentation and Training Materials: Review and comment for developing and enhancing documents and briefing or training materials, including review and comment to EVMS Description or related process documentation updates. · AzTech Templates: Access to AzTech Excel, Word, PowerPoint, and MS Project templates for implementing EVM. These include commonly required EVMS documents or forms such as Control Account Plans (CAPs), Quantifiable Backup Data (or “EV Worksheets”) for claiming EV % Complete, WBS Dictionaries, and briefing templates for major reviews. · AzTech Tool Support and Enhancements: Provide ongoing support for existing tools and bug fixes and prioritize wish lists requests in the release schedules. · Event Preparation: Help prepare the program team for major reviews via remote Webinars and above support items for SRAs, IBRs, JSRs, and Compliance Reviews. Also, review and comment on reviewing findings and corrective action plans. Our goal is to make it easier to purchase targeted support where AzTech may focus a combination of on-site and remote expertise. The tight statement of work, deliverables, and pricing force AzTech to create a custom, yet repeatable solution based on our years of EVMS support and compliance experience. Simultaneously, the compact services help our clients to provide focused support from the program teams, thereby reducing the time and effort it takes to prepare a program baseline and to find and fix issues before customer or government reviews. The short timescales encourage AzTech to provide training, coaching, and mentoring to the program team to improve corporate, functional, and program team skills and capabilities.